Oklahoma City Thunder forward Kevin Durant had some choice words for the media about the way one of the NBA’s top ten players of all-time had been covered this year. Durant might technically be right in what he said, but he needs to be very careful whose hand he is biting while his is still ringless. Los Angeles Lakers star Kobe Bryant announced Sunday that this would not only be his final season with the Lakers, but also his final season in the National Basketball Association. Everyone from former and currently players, to average basketball fans have weighed in on the Black Mamba’s career and the impact he had on the league. I like that Durant is being honest, and saying what is on his mind, instead of giving those cliche, canned answered the media seems to get from players daily. The problem with what Durant said is not just what was said, but more so who was saying it. Bryant is now 37 years old, and has played a grand total of 54 games since the beginning of the 2o13-14 season because of injuries. Durant went on to say today that he did not like the way people were focusing on Bryant’s poor play his final years rather than all of the great things Kobe has accomplished. I get that. Kobe has been trashed over the past few season, but rightfully so. Bryant has been playing poorly and has looked like a shell of himself. That type of play from an extremely popular player, regardless of who the player is, deserves to be brought up and discussed. Bryant has just been bad because he’s been injured and not on the court a lot over the past few seasons. Bryant’s production has steeply fallen off in ever statistical category, and that is not even a discussion. Anyone who does not believe that simply does not WANT to believe that. Bryant is shooting a career-low 35.7 percent in his last 48 games over the past two seasons. You can check out of the rest of Bryant’s stats for yourself at basketball-reference.com. One of the most telling stats is called Real Plus-Minus, which measures a player’s impact on team performance per 100 possessions. Remember coming into this season when everyone made a stink about Bryant being ranked 93rd by ESPN? Well, turns out they had statistical evidence to back up that ranking before the season started, and Bryant’s play on the court so far this season has yet to say he should have been ranked higher. Real Plus-Minus measures a player’s impact on team performance per 100 possessions. That table was featured in the exact article on ESPN.com that explained why Bryant was ranked 93rd. That article went on to say Bryant’s rating on the defensive end ranked among the 20 worst in the league last season, and I think it’s safe to say no one expected that all of a sudden to drastically improve. 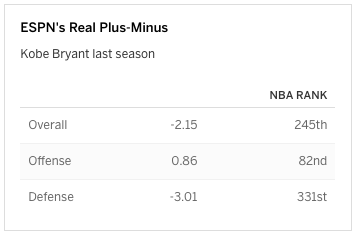 I’m not saying Real Plus-Minus is the end-all, be-all stat, but maybe the conversation should not have been if Bryant being ranked 93rd was too low, but if 93rd was too high? It also did not help Bryant’s case that he is currently in the second year of a two-year, $48.5 million contract he signed at the age of 35. While it’s hard to blame Bryant for taking whatever money he could get, it’s much easier to blame the Lakers organization for giving him that massive contract while trying to rebuild. I’ll save the rest of this conversation for another day, but with a contract like that it’s hard to say Kobe only cared about winning in his finals years on the court. It just seems to me Durant spoke too soon, and never gave the narrative a chance to change. People were focusing on the negatives when we thought Kobe was going to continue to play two, or three more seasons when he clearly looked incapable of playing at the high level he once used to play at. That narrative almost definitely will take a 180-degree turn now that Bryant has announced he’s retiring. He will get the treatment that Durant mentions other great players have gotten in their final season, and everyone will get to enjoy Bryant’s going away party while celebrating a great player that should be celebrated. As I said above, it is not so much about what Durant said, but that Durant was the person saying it. This is not the first time Durant has blown up at or been critical of the media. Durant told reporters at All-Star Weekend last season, “You guys really don’t know s—,” in response to a question about his former head coach’s job security. Durant also went on to say he was done being “politically correct.” As the ESPN article says, Durant had always been a polite and mild-mannered person when it came to dealing with the media. Whatever the reason for these outbursts, Durant should think a few steps ahead to what could happen if his relationship with the media changes. 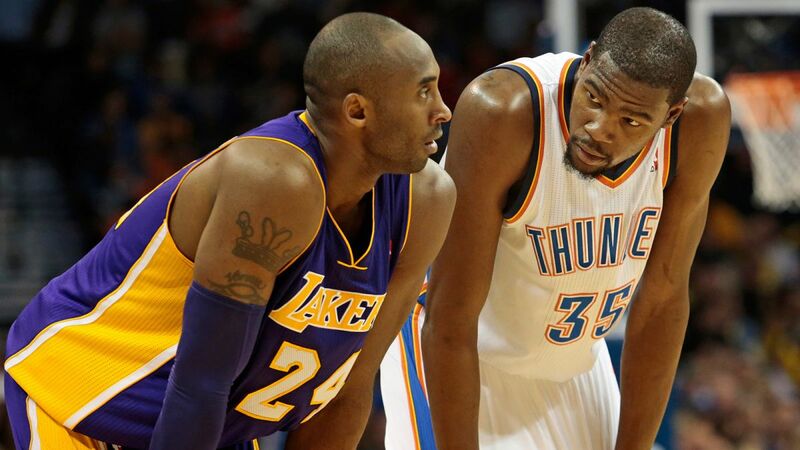 Durant is now 27 years old, and has played in the NBA for eight seasons. He has won a league MVP, but has only been to one NBA Finals, where he nearly got swept by the LeBron James and the Miami Heat in 2012. The pressure was mounting on James through his first eight years in the league, the exact opposite amount of pressure that appears to be on Durant. LeBron had just left Cleveland, and was playing his first year in South Beach as the villain. James, in his eighth season, failed to show up in many of the fourth quarters in the 2011 NBA Finals, a Finals the Heat lost to the Dallas Mavericks in six games. That trip to the Finals in 2011 was LeBron’s second in his first eight years, and began a string of five-straight Finals Appearances that could be extended to six this season. LeBron has also never played with as talented of a player as Russell Westbrook. Dwyane Wade was past his prime, Chris Bosh was never as good as Westbrook has been, and it is not even worth going through the players LeBron played with his first seven years in Cleveland. The counter to that is LeBron also never played in the much tougher Western Conference. Of course it’s not easy to compare players, especially when comparing anyone to James, who will surely go down as one of the best to ever play. As long as Durant keeps criticizing the media, it is only fair to bring up how fortunate he is to not currently be under the same pressure LeBron was in his eighth season. Sure, Durant did not enter the league as the self-proclaimed “Chosen One,” and Durant did not decide to deliberately wear no. 23 to be forever compared to Michael Jordan. But Durant is thought of as one of the best players in the game today, and as long as Durant is still ring-less he should think about the repercussions about what he says to the media. Right or wrong, the media has a lot of power in the sense of dictating public opinion. As Durant will likely enter the summer as a free agent, it could only help to have the media on his side. The last thing Durant should want is to turn the media against him just in time for him to make one of the biggest decisions of his professional career. This entry was posted in 15-16 Regular Season, Home, NBA and tagged Durant vs the media, free agency, Kevin Durant, Kobe Bryant, Kobe retiring, LeBron James, Los Angeles Lakers, National Basketball Association, NBA, Oklahoma City Thunder, The Announcement, The Chosen One. Bookmark the permalink.